I loved the main and supporting characters who are multidimensional, flawed and relatable. Kelie was bold, assertive, impulsive, and though she had her fears and doubts, she was courageous to face them head-on. She was passionate about her cause and not afraid to fight for what she believed in. By contrast, Amari was gentle, patient and even indecisive at times. However she was a fierce warrior who knew when to strike with her sword. I liked that both Kelie and Amari were strong female MCs- they were willful and independent, though they also had a soft and vulnerable side. Inan, the prince of Orisha, was the third POV character in this book. I liked that, in addition to being a love interest, he took on a morally grey role and had important character flaws which made him interesting to read about. I also enjoyed reading about the relationships in this book- the romantic as well as the platonic ones. I loved the slow-burning chemistry in the romantic relationships. I also loved the sibling dynamics between Zelie and Tzain, and Amari and Inan. In addition I loved that there were strong and positive relationships between the female characters. There were quite a few secondary and minor characters in the book, and unfortunately due to the circumstances in the plot, some of them did not survive. I wished to have gotten to know these characters better before they were killed off. The plot was engaging and well-paced. I liked that the characters were given a series of tasks to accomplish, and that with the resolution of one issue, another problem was always on the horizon, so that the plot continued rolling. I also liked the representation of people of colour in this series. I liked the idea of bringing attention to issues such as racism in a subtle way through the fantasy storytelling. Usually I am not a huge fan of multi-POV books however I find that the 3 alternating POVs worked well here. Overall I enjoyed the writing style and I liked the worldbuilding aspect in this book. Descriptions were detailed but not overstated, and while I was reading I did feel immersed in the culture of the towns and cities the characters visited. I liked that Orisha had its own religion and politics as well, all of which were portrayed vividly in this book. I also liked how people’s belief in the gods was linked to how magic worked. My only complaint was that I wished to learn more about the “rules” of magic- what was doable, what were the limits, and what were the consequences. Although the limits of “regular” magic vs “blood magic” was alluded to in this book, and there seemed to be consequences to using blood magic, I feel that these things weren’t too clear. 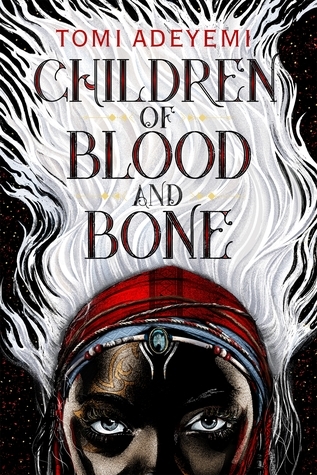 Overall The Children of Blood and Bone was a fast-paced YA fantasy novel with strong characters and great chemistry between them. After reading this book, I will definitely be looking out for book 2! Have you read Children of Blood and Bone? If so, what are your thoughts? What are your favourite fantasy novels and/or worlds? I just picked this one up — excited to read it soon! Great review! Some people told me not to read it but I’ve decided to give it a shot! Hey Beth! Sorry to hear that this one didn’t live up to the hype for you, although that is good that it sounds like you’ve enjoyed it overall. Yeah overall I still thought it was a great book, I think it was just too hyped up that it couldn’t live up in my mind. Exactly, I feel like it would have been better to stick with Amari and Tzain in this book and if there needed to be a relationship between Zelie and Inan develop it slowly over the course of the series. However many books that will be. Yeah I think I get what you mean, is it kind of like they were brought into the story solely to be killed off? That can kind of stop you from being attached to then, especially when their development isn’t great for that reason as well. I think I can see what you mean about Zelie and Inan, since their relationship turned around very quickly and it would be easier to get to if this development happened slower. Yeah, like I’m not sure where things will go throughout the series but if the development between Zelie and Inan in this book had happened over two, or even three books it would have been better! That’s true. The developments in the relationship happened really fast, and I’m not sure how it will progress further. I guess we’ll see how it goes! Thank you Carolina 🙂 Glad to hear that you’ve enjoyed this book. Yes I am also looking forward to book 2! Fantastic review, and I loved this one too! Can’t WAIT for book 2! Thank you 🙂 I am looking forward to book 2 as well! I have heard good things about this book; it sounds exciting. I love a multicultural cast. Most fantasy I have read have MC’s who are either Caucasian or Middle Eastern. I did like though how in Kate Daniels’s world each monster she had to fight was from a different culture’s mythology. I look forward to reading one day Annette Marie’s Red Winter which features Japanese mythology. Hi Stefanie 🙂 yes I love the diverse cast in this book as well. Hope that you’ll have the chance to read this book one day.